Work for Udemy for Business? 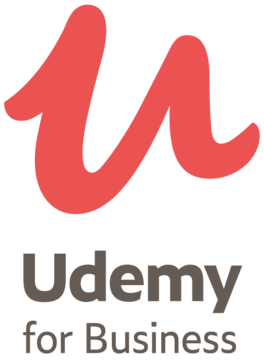 Learning about Udemy for Business? "Fantastic topics and quality of courses"
The ability to be taught about relevant business topics. Udemy's user-friendly interface is well designed. Navigating through courses is very simple and easy to do. Each course has reviews to make it less difficult to find courses with good instructors. The class also picks up wherever you last stopped, which is great when you go through the courses in your spare time. Time-commitment required to get through some of the courses. Many are hours and hours, so summary courses would be nice to have. Wait for sales, and take advantage of the service especially when your employer is the one footing the bill! Udemy for Business makes it easy to learn different programming languages for my business, such as Swift, C++, and Python. I can access courses from anywhere at any time. "Udemy is a great source for professional development"
Love the mobile app and the content is great. Overall I highly recommend it. I've learned SQL, advanced excel formulas, and lean six sigma. Not very easily searchable, in my opinion. Its difficult to tell what is free (covered by my workplace) and what isn't. I wish it was easier to browse free content. Highly recommend it for professional development, but I would recommend that a list is compiled for free resources at your organization. We have used this for office-wide sexual harassment training, but we were unsatisfied with the pre-made content we received. We have not used this for office-wide training since, and are focusing on making our own internal content. However, we do love it for professional development opportunities for our workers. Its been a great resource for that. "Great topics & quality "
I wish there were more summary / shorter courses if you don't have as much time to commit. There isn't much to dislike about a product like this that is intended to enhance your mind. It's free for me since my company sponsors it. Take advantage of it if it's paid for by your company. Expanding my knowledge base; bushing up on skills and learning new ones. It's nice to be able to dabble in a few other topics outside my industry. "Best Tool Out there for Learning"
"Great resource for businesses and students"
A very smooth user interface, with a stellar navigation system. Great way to connect teachers and professionals to students and employees. Maybe the lack of courses? Or the time-commitment needed for courses? These are minor though. Just do it, its a great resource! Better training leads to better employees. I've personally improved my marketing knowledge and skills after viewing the courses. Way better than buying a book and trying to mug it all up. I took web development and hacking courses with udemy. The content is really good and they give great examples! I also took python complete development course. "Great learning portal for new employees and training!" I really like the course catalog and variety of courses offered, from design to development tools. There's nothing in particular I dislike about the product. Although I haven't explored this much, it would be nice if managers can assign specific courses and track training progress. "Udemy for your business needs"
Udemy is flexible and allows your company to design content. A great tool for companies to use to support professional development. App and website do lot always sync well. Many team members lik the ability to use the mobile app, makes learning more accessible. Better way to offer learning and professional development to team. "Love this software! Me and my employees have learned so much!" The variety is mind blowing. So many different topics and themes to explore and learn. It is invaluable to me and my employees, I would have paid even more than I did if I knew the possibilities. As of now, nothing. I love how much content is on here for me and my employees to learn and grow from. Certain areas where my employees needed growth or more training, or just some more knowledge in a specific area, this program solved. * We monitor all Udemy for Business reviews to prevent fraudulent reviews and keep review quality high. We do not post reviews by company employees or direct competitors. Validated reviews require the user to submit a screenshot of the product containing their user ID, in order to verify a user is an actual user of the product. Hi there! Are you looking to implement a solution like Udemy for Business?